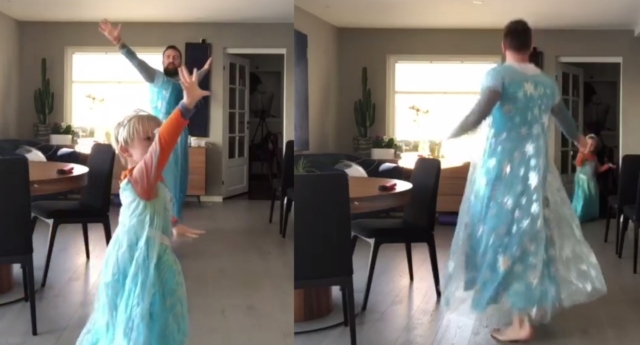 A viral video features a dad demonstrating exactly how to parent, with help from Frozen track “Let It Go”. Proud father Ørjan Burøe uploaded the viral video of himself looking after 4-year-old son and Frozen fan Dexter. The pair appear to have put some practice into the routine, pulling off some pretty adorable dance moves. The viral video has received 20 million views on Facebook and 250,000 shares, with users flooding the page with praise for parenting unconstrained by gender. One top comment says: “This is so cool. Children like to play, like to dress up. Another added: “Your boy is gonna have a great life, with you as his role model. If i had a father like you, i may not have lived the first 27 years of my life in the closet. A few people also noticed Burøe’s costume was missing a few pieces. Award-winning singer Adele was praised by fans in 2016 after she was spotted at Disneyland with 4-year-old son Angelo, who was wearing a Princess Anna dress. Though the singer keeps her son out the spotlight, she has been vocal about her inclusive approach to parenting, explaining: “I can’t wait to know who his best friends are going to be, who his girlfriend or his boyfriend is going to be… whatever my kid wants to do or be I will always support him no matter what”.